I have shared previously in Whats the Good Word that my morning quiet time has brought me to a review of the writings of the prophet Jeremiah in the Hebrew scriptures. This morning I am thinking about the shepherds in Jer. 23:1-4. Jeremiah used the term “shepherd” in a different way than we normally do today, so perhaps that is the place to start. For me, and perhaps for you, the image of the shepherd is coloured by years of Christmas pageants and the many idealized and romanticized paintings of Jesus the Good Shepherd we are probably all familiar with. In the gospels, Jesus uses this pastoral image to describe his own role. This must have been quite jarring to the people of his day, since shepherds were not the normal, ideal role model for a teacher/rabbi. Jeremiah uses the image of the shepherd to refer to the kings of Israel and Judah. The author blames the rulers of the nations for destroying and scattering the sheep, referring to the invasion of King Nebuchadnezzar and the Babylonian captivity. In this text, the scattering of the sheep is a direct result of not being faithful to God and allowing the people to chase after other deities. 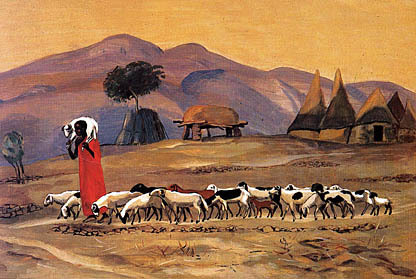 Today it is common to use the image of shepherd interchangeably with that of the pastor. The pastor/shepherd is one who watches out for and cares about the well-being of the congregation, the people within her/his care. Rather than destroy or scatter the flock, the pastor is expected to protect the sheep, see that they are spiritually fed and nourished, and generally tend to their needs. Perhaps the oldest question in Scripture is “Am I my brother’s keeper?” (Genesis 4:9) Am I expected to guard, protect, or attend to those around me? The testimony of both Jeremiah and Jesus is a resounding YES! The thing all of the above images have in common is the idea that we have responsibility to care for others, especially those within our sphere of influence. Inevitably, that bring me/us to a consideration of my/our own pastoral ministry. Am I/are we being a responsible shepherd in caring for the needs of others? Do I/we attend to them, notice when they are missing, go visit them and check to see if they are okay, assuring them that they still have a place within the flock? Or do I/we simply lament the fact that they have wandered away somewhere,and the flock keeps getting smaller? Am I, as a pastor responsible for all of that? Once again, the testimony of both Jeremiah and Jesus is a resounding YES! That peaceful, pastoral image of the shepherd can be most disturbing at times, can't it? No truer words or advise can you give than what you have so eloquently stated in this blog. Often as Pastor's we get so caught up in the administrivia that we forget our first responsibility, to be the servant leader to our congregations. Thank you for the reminder, to Pastors, and to all of us in the Community, that we are first and foremost our Brother's keeper. Thank you for your kind words and thought, Mel. The "administrivia" you spoke of can seem so very demanding at times, and while we ignore it at our peril, it is the people that really matter. Thank you for sharing your thoughts.